Home News Tech Tip Top 10 Top 5 Internet Browsers In The World in 2010. 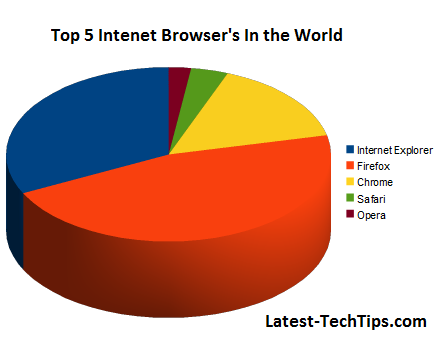 Top 5 Internet Browsers In The World in 2010. The world is addicted with the internet. A major portion of the educated youth use internet for at least 2 - 3 hours a day. But which Internet Browser is the most extensively used of all? Is it the IE or Firefox or Chrome? To put your curiosity to rest here is a comprehensive Top 5 list of Internet Browsers used around the world. The number 5 spot is taken by Opera, with 2.21 % users using Opera across the world. Opera is generally a favorite for mobile users as it takes mobile internet surfing realistically close to a Computer. Opera browser developed by Opera Software. The company also claims that it has the fastest browser on the planet. The cool looking Safari Browser is developed by Apple. Apple is known for its highly attractive and user friendly UI in all its products. Be it Mac or iPhone Apple's UI is always intuitive. The same thing is applicable for safari browser. The Safari Browser is used by 3.68 % of the people around the world. Developed by Google Chrome is at No# 3. Anything Google does must be in the top 3 at least and Chrome is just one example. Chrome has left Safari and Opera browsers far behind in a very short period. It is also known for its fast performance and simple UI. 15.40 % people around the world use it. It is a flagship Microsoft Browser and comes with only Windows operating system. Windows is the No# 1 Operating Systems in the world. Internet Explorer is one of the oldest Internet browsers of all time and has taken the second spot (surprising). It is used by a staggering 32.14 % people around the world. The worlds most famous browsers and available in both Windows and Linux platforms and used by almost half of the world since many years now Mozilla Firefox is the Worlds No 1 browser and also my personal favorite. Used by 45.85 % of the people around the world FireFox is one of the best creations in the internet history. Mozilla is open source. Every browser has its strengths and weakness and every browser tries to outsmart the other, it is difficult to predict who would be the future champ. Chrome is giving tough competition to IE it would be interesting to see what trends we have in the year 2011. The source of the data is W3C and is applicable for the year 2010. Nokia X6: Using Internet Tips Just Like A Computer with Opera Mobile.